ABC’s Suburgatory is about a relatively normal father and daughter who move from New York to the dysfunctional suburbs. 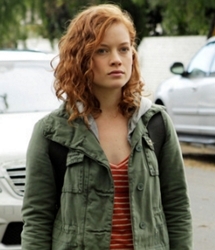 Hip Tessa (Jane Levy) and her father George Altman (Jeremy Sisto) stick out like sore thumbs in Chatswin Township. The show is often difficult to watch because it seems to unrealistic, but sometimes there are interesting subplots about hair or related topics. In the “Thanksgiving” episode Tessa is upset because her father George has decided they can’t honor their long held tradition of spending the Holiday in Tessa’s beloved The City going to the Macy’s Day parade then drinking traditional black and white milkshakes. George obviously feels a little guilty about not taking Tessa to New York and claims to have to work. He asks Dallas Royce (Cheryl Hines) to take Tessa on a girls day out which results in a trip to the salon. Dallas who finds Tessa’s naturally textured hair inappropriate for Chatswin Township convinces her, after much cajoling, that if she agrees to a Brazilian Blowout hair straightening treatment Dallas will take Tessa anywhere she wants to go for lunch. Of course Tessa, being a very savvy teen who is wiser-than-her-fifteen-years initially balks at changing her hair, even temporarily That is, until he figures out that if she has the Brazilian Blowout she can command Dallas into driving her back to New York City. With their newly straightened silky hair, Dallas takes Tessa to New York where she buys a handful of knock-off handbags at $15 a pop from a street vendor. Their lunch consists of grease filled pizza slices. Meanwhile Tess and Dallas catch George playing tonsil hockey with a gorgeous young Latin babe. Tessa ultimately confronts her dad during the Royces’ Thanksgiving dinner. It was touching to watch Tessa surrender her proud attachment to her natural hair texture for a chance to visit her beloved City. Ultimately it was worth it to her. Not only did she have a chance to bond with Dallas, but she was able to help her dad recognize his hypocrisy about never returning to The City. During their fun day, the two girls run across George making out with a woman while he was supposed to be “working.” Angry with George for lying to her, Tessa confronts him during the Royces’ Thanksgiving dinner. The episode was about tradition and turned up the spotlight on just how dysfunctional Chatswin Township really is. The subplot about Tessa’s hair also illuminates a common pressure that many teens experience from their family and friends over their appearance. Dallas obviously disapproves of Tessa’s naturally textured hair and literally bribed her to have it straightened. Tessa’s dad George made a point of complimenting his daughter on her new hairstyle which Tessa seemed to barely tolerate. How often does this happen in real life? How much pressure are teens subjected to regarding the color, length and texture of their hair? Although the subplot about Dallas bribing Tessa to get a Brazilian Blowout was relatively short, it was very noteworthy and a poignant life lesson. This entry was posted on Thursday, November 24th, 2011 at 9:57 pm	and is filed under Curly Hair. You can follow any responses to this entry through the RSS 2.0 feed. Both comments and pings are currently closed.